Zion Market Research has published a new report titled “3D Camera Market (Free Camera, Target Free Camera and Others) by Technology (Structured Light, Time of Flight and Stereo Vision) for Smartphone, Cameras, Computer, Tablets, Notebook PC and Other Applications: Global Industry Perspective, Comprehensive Analysis, Size, Share, Growth, Segment, Trends and Forecast, 2015 – 2021”. According to the report, the global 3D camera market accounted for USD 1.25 billion in 2015 and is expected to reach USD 7.89 billion by 2021, growing at a CAGR of around 35% between 2016 and 2021. The 3D camera is an electronic device used to capture the three-dimensional image. It is consisting of 3D technology. It has more than two lenses with separate sensors. It acts as a human binocular vision and hence able to capture three-dimensional images. 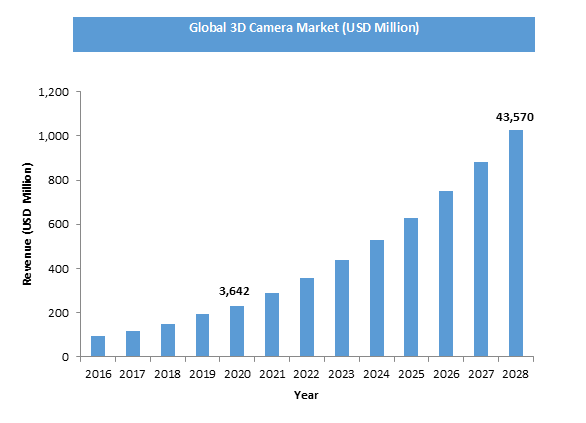 Rapid technological advancement and improved visual applications are expected to fuel the growth of 3D camera market across the world. Demand for the 3D camera is increasing at a rapid pace as compared to the digital camera. However, smartphones increasing concern regarding cost is expected to affect the growth of this industry over the forecast period. Moreover, lack of awareness among end-users about this technology is also expected to prohibit the growth of 3D camera market. The target-free camera has the largest market share in total revenue generated by global 3D camera market in 2015.Professional cameras majorly used in the media and entertainment owing to its ability to record real life scenario. Stereo camera technology is useful for taking 3D still photographs with two smartphones is the largest application segment in 3D camera market across the globe. Smartphones are available at lower cost with 3D technology is expected to fuel the growth of 3D camera market over the forecast period. North America was dominating the regional market for 3D camera in 2015.Growing demand for the 3D technology and visual effect from the entertainment industry is expected to drive the demand for3D camera in Asia-Pacific region. Emerging economies are expected to experience rapid growth in demand for the 3D camera during the forecast period due to improvement in the purchasing power and adoption of latest technology in developing countries. Key players in the 3D Camera market include Panasonic Corp., Nikon, Samsung Electronics Corp., Sony Corp., Kodak Fujifilm Corp., Faro Technologies., LG Electronics Inc., Go Pro. Canon and others.